Yampa Safari - Scenic family float trip with wildlife viewings, only 20 minutes from town. 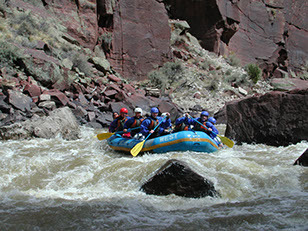 Being based in Steamboat Springs we are blessed with a variety of white water rafting and scenic float trips, all within a reasonable drive from our downtown boathouse. This allows us the opportunity to provide you with several river trips to choose from. Depending on the time of year, Mother Nature and river flows, we will match you with the best trip available to satisfy whatever goals you, your group or your guests may have. Yampa River - Rafting trip running from the Ski area to the KOA campground. At Blue Sky West, you will find a committed operation dedicated to having as much fun as possible while providing a safe and educational tour to all of our guests. Your trip with us will include only the best equipment, the most knowledgeable and entertaining staff as well as an opportunity for you to have a great experience in the Colorado outdoors. We Love our job and would like to invite You to come play with Us! Blue Sky West operates under special use permits from the BLM, Routt - Medicine Bow National Forest, Colorado State Parks and the City of Steamboat Springs. Blue Sky West is an equal opportunity service provider.